Here you’ll find software that is useful in the radio studio, production booth, theatre/sports-ground, or just at home managing a music collection. 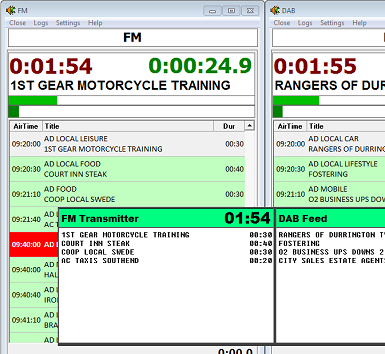 Whether it’s a jingle/sound-effects application, broadcast audio logger, AM/DAB/FM transmitter finder, a studio clock/status display, split advert/jingle playout or even a split-link recorder – there’s something here for community, commercial and internet broadcasters of all sizes. Alongside my own efforts which you can try (and buy), I often produce custom solutions for broadcasters (large+small). However, I’m fully-booked so unable to undertake new custom work at this time… Minor mods/tweaks+updates to my existing software remains unaffected. DAC Cartwall is in use at many locations from home-studios, community radio to larger commercial broadcasters as well as the BBC. It’s perfect for outside events and spot-effects in theatres. Each “Set” offers 10 pages of 56 buttons plus an unlimited number of “Sets” giving you almost instant access to your audio. Create a set for each show, presenter or daypart – Buttons can be coloured for easy recognition and then played instantly or loaded into a “deck” for manual start/stop. Automatic ducking/fading and player sequencing also supported. Drag ‘n’ drop or use the built in database to import, sort, search and play audio effortlessly. Play MP3/WAV audio from your local C: drive, USB stick or network share. Reads CartChunk, ID3 tags and JMD/MyLibrary. There’s even remote-start, a text log file of played tracks and UDP network control. Any simple onboard soundcard will work, or route each player to a separate device – a cheap 7.1 soundcard gives you 3x stereo outputs. Even if you already have a playout system, DAC is a great way of allowing your presenters to load their own audio from memory-sticks for specialist shows, news programmes etc without disrupting your main playout system. Take control of your playout software with my USB Remote-Start Interface which acts as a joystick to control most playout software. Can be used with any mixer that features “fader-start” buttons, eg: DX1000, DX2000, XB14 or Sonifex S2 and other “pro” consoles. The unit can also be used to display status alerts (such as mic-live “On-Air”) from StudioScreen. Designed to run on a wall-mounted flat-screen, StudioScreen offers stereo VU Meters, silence alert, large analogue clock plus OnAir/Phone signalling and a “now playing” display. It accepts incoming UDP commands from a playout system allowing you to designate an LED to your “traffic flag” status or other alert. A cheaper “Basic” licence offers a single VU Meter, Clock, Now Playing text and 1 “OnAir” LED. The Pro Licence adds another VU Meter, LEDs 2,3,4, UDP network/remote control, RSS news and weather temperature displays. Both licences allow for simple control via fader-start/contact-closure via joystick (such as my USB Joystick Interface) or Vellemen K8055. SplitVT now handles up to 24 splits – both Lite (4 splits) and Pro (24 splits) can now be purchased online. Works in a live “split” environment as well as helping to record multiple links for different stations as part of a pre-recorded show.